The preferred Hotel of AFL Cairns! 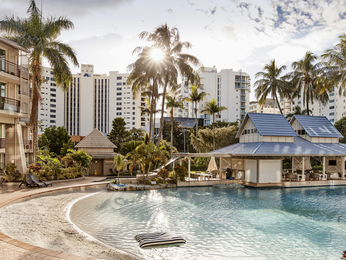 AFL Cairns is proud to have partnered with Accor to provide AFL Cairns members and supporters with fantastic accommodation deals at their wonderful Cairns and surrounds Hotels. So next time you are looking for accommodation, please remember to support the official accommodation partner of AFL Cairns, Accor Hotels. Offering spectacular views over the harbour, mountains and city, guest rooms at Pullman Cairns International allow guests to relax and unwind in comfort and style. 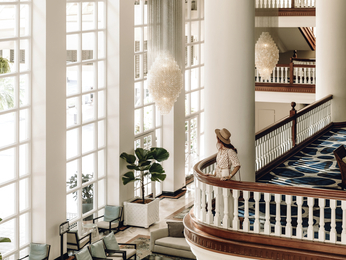 With accommodation options for business and leisure travellers, guests staying at this beautiful Cairns hotel can choose from 321 spacious and elegantly appointed rooms, with Premium, Executive and Presidential options available. Each room features a private balcony, HD TV with video-on-demand, a work desk, blackout curtains and room service. 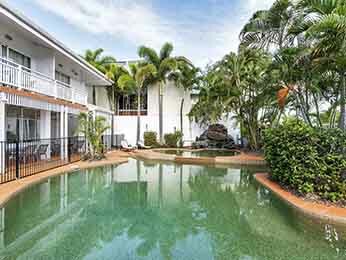 Offering stylish apartment-style accommodation on Cairns Marina, Cairns Harbour Lights is the perfect option for visitors looking for hotels in Cairns. The hotel features a range of accommodation styles including hotel rooms and one, two and three bedroom apartments, each with a private furnished balcony and striking views over the city parkland or water. Apartments feature a modern ensuite, a kitchen or kitchenette, laundry facilities, and a separate dining & living area with LCD TV & Foxtel Channels. 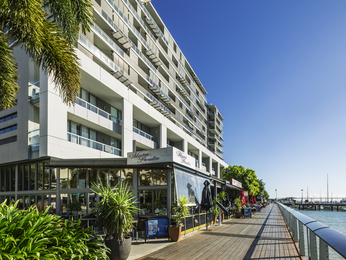 Located in the city centre, ibis Styles Cairns is just two blocks from the beautiful Esplanade and Lagoon pool. The Civic Theatre, Night Markets, Reef Terminal, casino, cinemas, shops and entertainment are only a short walk away. The hotel features 75 rooms, 24 hour Reception, tour desk, restaurant and bar, pool, BBQ facility and guest laundry. Guests can choose from a variety of room types to suit. Offering great value, the hotel provides Foxtel and Satellite channels and unlimited, free WiFi. 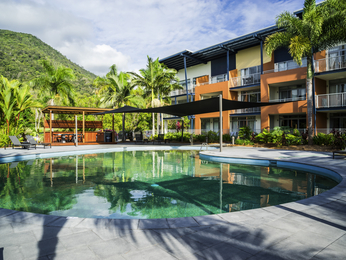 Relax in tropical 4-star comfort at Novotel Cairns Oasis Resort hotel, five minutes’ walk from the esplanade. Your airy modern room’s balcony overlooking the lagoon pool or the lush gardens is the perfect private space to unwind. With the swim-up Aqua Bar and the pool’s white sand beach, both kids and adults have fun at Novotel.